If you’ve never heard of Iron Chef Morimoto, you probably don’t deserve to taste the exquisite dishes he has on the menu at the New York restaurant bearing his name. We had been to Morimoto’s for lunch several years ago and fell in love with the place. My wife took me there for my birthday dinner during our recent dream trip to New York and it was as good, if not better, than I remembered it being. My wonderosu birthday sashimi platter at Morimoto’s. I’m sure the raw food movement folks would approve of my choices at Morimoto’s. I began with a diver scallop carpaccio, served cerviche style, which means the scallops, cut into wafer thin slices, were marinated in a citrus base, likely lime juice. 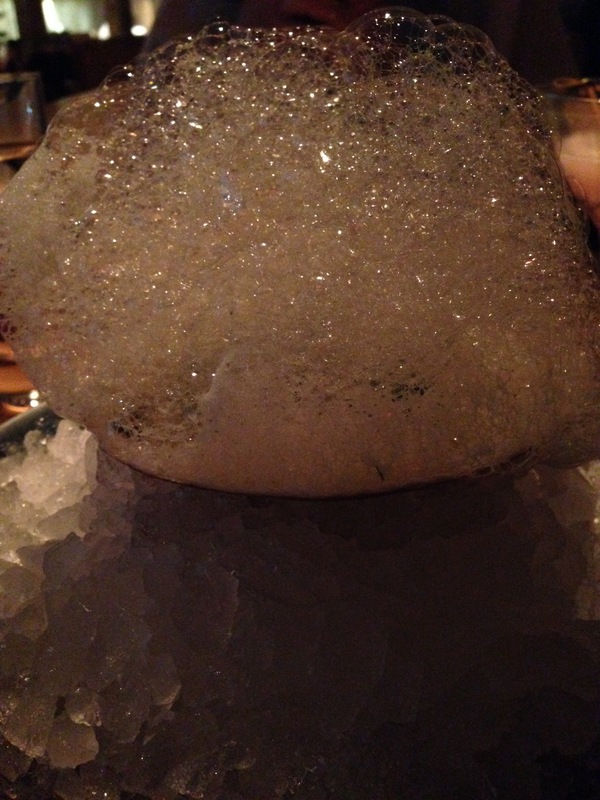 The dish came with a foam atop it that added a wonderfully whimsical touch. Finding the scallop slices amidst the remnants of foam was an adventure, but each one tasted better than the last, I was very sorry when I was done with this dish. White rice is off my menu since my angioplasty, so instead of sushi I ordered a massive sashimi platter. 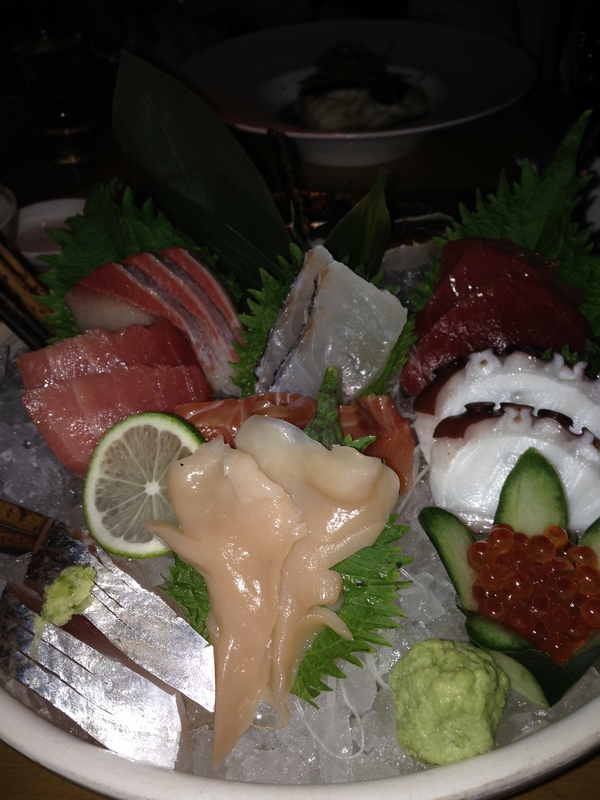 Sashimi is just slices of various fish, raw, so the skill here is in selecting the best fish each day to include. My platter came with 26 pieces of sashimi, including the legendary otoro which is the fatty under-belly of tuna. One site describes it like this: “This cut is fatty almost to the point of falling apart and can literally melt in your mouth.” Amazing. 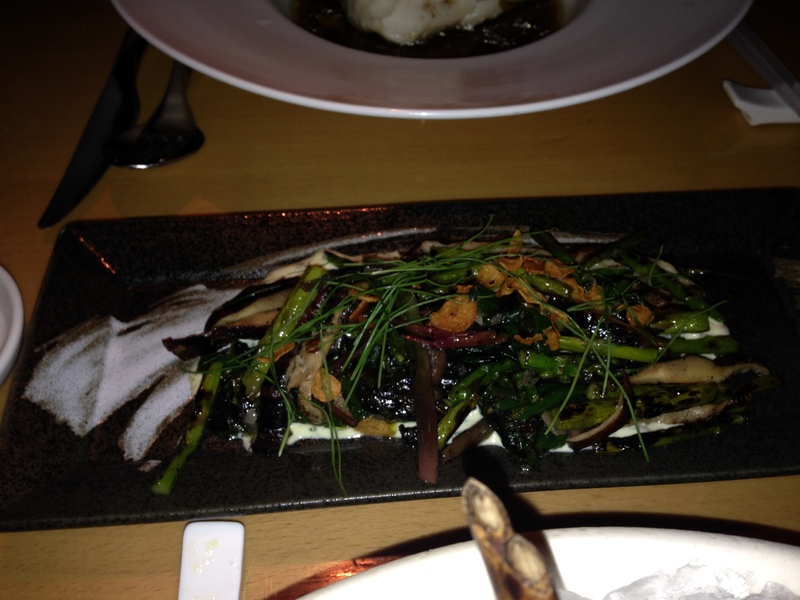 I did get one cooked item, asparagus, which sounds simple but in Morimoto’s hands become a new dish entirely. I can’t find it listed in the online menu, so it may be a seasonal offering not there when you go, but if it is, try it. Asparagus like you’ve never tasted before. The restaurant kindly brought me a birthday dessert treat as well, likely because my wife had told them we were going there for my birthday dinner. It was a creme brulee of some sort, I think, again I don’t see it on the standard menu. Morimoto’s is certainly one of my favorite restaurants ever and worth a low-salt, low-fat diet splurge.